As the cars shot off from the grid, we wondered when they’d reach our seats. We kept looking, waiting. They went by so quietly we almost missed it, prompting myself and the Jalopnik staff to crack up laughing. When I realized the lack of noise likely made us sound obnoxious, I looked around. Everyone else was laughing, too. It goes without saying that the lack of noise was expected from an electric car race. I just didn’t realize the experience would come with that many surprises. When a handful of the Jalopnik staff and myself went to our first FIA Formula E Championship race in New York City over the weekend, we, overall, didn’t know what to expect. For Formula E, the world’s first electric street-racing series that began in 2014, the race was its first in NYC. It was kind of a big deal. But we came to see the race cars, and to satisfy the ongoing obsession my boss Patrick George has with obtaining some Faraday Future t-shirts. So, we found ourselves at the NYC ePrix, watching electric cars take on the Brooklyn Cruise Terminal. I’d been following the series on television, but there are just some things TV can’t convey. Take, for example, the sound of the Formula E race cars, which I expected to be a less intense version of the classic open-wheel whine. Instead, there really was no inherent car noise. It was almost absent, which was a huge surprise—for myself and the rest of grandstand I sat in, as you can tell. So, here’s what I, your resident racing nut, learned on my first-ever trip to an electric-car race on Sunday—for better and for worse. Cars are going electric and autonomous, both of which the all-electric Formula E and its planned support series, a driverless all-electric series called “Roborace,” look to tackle. But that huge shift in the car industry makes for a weird shift in racing. Electrified cars are efficient and quiet, as anyone who’s ever almost been run over by a mid-2000s Toyota Prius can attest to. If a spectator were to find a way onto the track like always seems to happen in Formula One, that person would never hear the cars coming. That means the loud, ear-shattering race-car noises we all know and love—mainstays at rally, Formula One, NASCAR, really anything—were nowhere to be found at Formula E, resulting in the laughter of your friendly Jalopnik staff and everyone around us. It wasn’t mean spirited—it was a “Wow, what just happened?” type of laughter. The cars came out of nowhere, it felt like. This stuff was almost quieter than a PGA Tour event, and I say that because people generally know when to clap there. Because of the lack of noise, the wonder of when cars would circle back by on this winding little street circuit never really ended. They just came and they went, and our laughing died down after a bit. But the more I thought about it, the more I kind of liked the lack of sound in certain circumstances. That’s not saying I’d ever support a soundless NASCAR race or that I have ever supported the quieter F1 cars, but the eerie quiet was revealing in a way. All of the sudden, I wondered about something that had never crossed my mind—I wanted to know what other race cars would sound like without noise. You see, when the Formula E cars rounded the corner right in front of my grandstand, I could hear everything. I could hear them hit the makeshift kerbs around the track’s turns. I could hear the body of the car bounce up and down on the chassis. I could hear the treaded tires skid around the turn. It made the cars sound vulnerable, less precise, and even plastic-y at times. It was like they were there in the flesh, with no noise to hide their imperfections. Every element was exposed—the good and the bad. It was fascinating, and I suddenly wanted to know the imperfections of other race cars. In a world of downforce, finely tuned engineering and perfecting the racing package, I wanted to hear what an F1 car sounded like while rumbling over the speed bumps. I wanted to hear the likely unpleasant noises a NASCAR race car made when slamming kerbs around one of the sanctioning body’s few road courses so hard that it leaps into the air, or when it moves down from the high banking onto the flat apron of the track. When I looked up the track layout for the race on Friday, the only thing I could say was, “Wow, this circuit is tight.” Really, just look at it—10 turns over the course of 1.21-miles, including a hairpin of a pit lane, is kind of wild. That’s a lot of brake action and not a lot of time to accelerate. Given that stock cars are known to freak out under that much braking in such a short amount of time, he had a good point. Some of those turns looked more like a kindergartener’s worst attempt at cursive than a race course—they were crazy tight and crazy weird. Sure, the course was in the middle of a packed cruise-ship harbor in Red Hook, but even a Miata would struggle with some of those corners. When I got to there, the circuit setup was even weirder. The catch fence was so short that even I had worries about spectator safety, and I’ve watched NASCAR races atop the sketchiest of makeshift infield platforms. The course also lacked substantial runoff sections or areas to pull off of the racing surface from my vantage point. Building runoff areas into street circuits is a challenge, but not impossible—look at all of the areas you can duck off track in Monaco. Meanwhile, Formula E cars were getting stuck right near the racing line in front of our grandstands. The racing was close at the top and it was fun to watch, but I felt no awe of a high-speed spectacle and didn’t feel the crushing reality of wrecking a race car at high speeds. There simply was none of that. With all of the speed speculation spinning around in my head, I decided to do some research on it. Autoblog reported that Formula E’s rulebook said speeds were limited to 140 mph by the FIA during its inaugural 2014 season, which is about how fast Texans go on the highway. The series announced that cars would be “significantly faster” for the 2015-2016 race season, but championship boss Alejandro Agag didn’t “want to talk about how many seconds per lap” with Autosport. He didn’t give any other numbers, either. It left us in the dark about top speeds. Before the 2016 season, Faraday Future Dragon Racing said its Formula E car had a top speed of 150 mph. With a quick look, I couldn’t find anything about speeds or speed limitations in the 2016-2017 version of the FIA’s rulebook for the series. I was striking out from every angle on this, but maybe that’s the point. Autosport later noted that cars didn’t reach 200 kilometers per hour (124.3 mph) in race trim in 2015, but didn’t cite where the information came from. Former F1 and current Formula E driver Jean-Eric Vergne told Autosport that even though the cars were “not quick,” they were “extremely difficult to drive” due to heavy weight and a lack of grip. “At the moment you just hit the accelerator coming out of every corner and it’s fine, no wheelspin, no trouble. “So it could be more challenging in that respect. But top speed is not so important. So, why not run faster circuits? If you thought a young, startup series promoting a new-ish concept would be easier on the budget than a good ol’ weekend of NASCAR, you thought wrong. 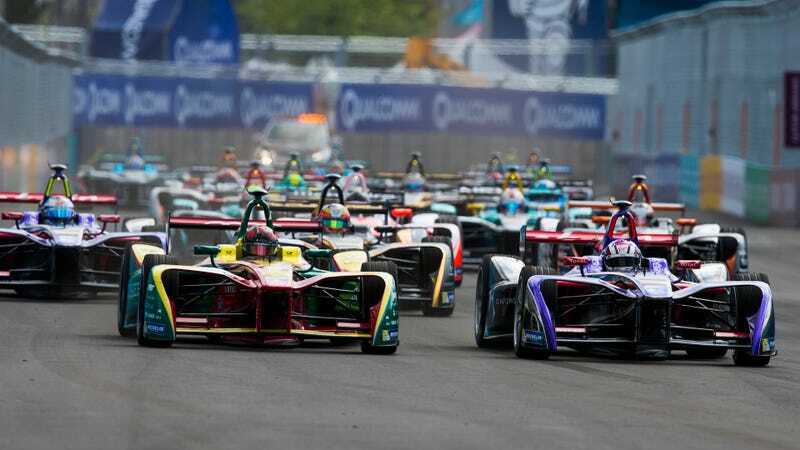 The tickets to see Formula E’s first race on the streets of NYC were incredibly expensive, and, if I were the average local with no interest in racing at all, I would have tossed any idea to go right out the window as soon as I saw prices. The single-day tickets ran $85 for standard admission, $55 for students and $42.50 for children ages 5 to 15. Weekend race tickets were $150 for standard admission, $95 for students and $75 for kids ages 5 to 15. Standard admission meant you could sit anywhere, which threw some of the people in our area of the grandstands off. We’re used to assigned seating in America. But those prices meant that if you took a family of four with your youngest child and college-aged kid to the races, you’d be out $470 before any taxes or fees. That’s a lot of money to watch a three-year-old series race for a weekend, especially when the race had an advertised zero car parking and encouraged spectators to travel to the track by any other means than their own vehicle. Even though it wasn’t your average family weekend out in terms of pricing, the one thing Formula E got really, really right was the area the event was run in. The circuit backdrop was the Statue of Liberty and Manhattan across the channel, which was beautiful enough in itself and could be thoroughly enjoyed in the peace and quiet of the race. In the most extra post-race celebration there ever was, the series even coordinated ships to spray fountains of water just off of the harbor. And the neighborhood where it was held, Red Hook, turned out one heck of a car show later on. Whether on purpose or not, spectators left the electric-car race to see all of the petrol-powered beauties of the world—old-school Porsches and Scouts and classic BMWs, oh my—which was a nice juxtaposition of old and new. Overall, Formula E was a fun time. The racing was solid entertainment and a good thought exercise about the future, and its hour-long duration kept my sunburn from getting too out of hand. It badly needs a support series for the investment it takes to the track, but the driverless Roborace hopes to bring that around within a few years. That being said, with the changing landscape of the car industry, none of us can really say where auto racing in general is going. I won’t call it “the future” the way everyone else does; not yet. But whether Formula E is here to stay or ends up being just a blip on the timeline, it was an event I’m glad I got to experience.